This wonderful holiday themed stationery design is a great way to enhance your greetings, invitations, and announcements this Christmas season! 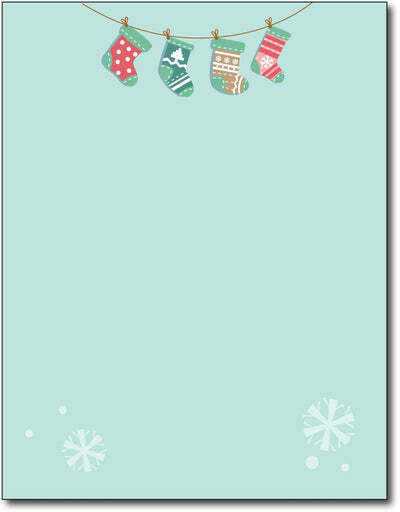 Each sheet of Christmas printer paper is lined with 4 holiday stockings at the top with some larger snowflakes towards the bottom of the sheet- all over a beautiful light blue background. The stock used for this design is a premium quality 28 LB Bond / 70 LB Text paper, and measure 8 1/2" X 11". This stock used for this design is a premium quality 28 LB Bond / 70 LB Text paper, and measure 8 1/2" X 11". This holiday themed stationery works perfect in laser and inkjet printers, as well as copiers of all kinds.